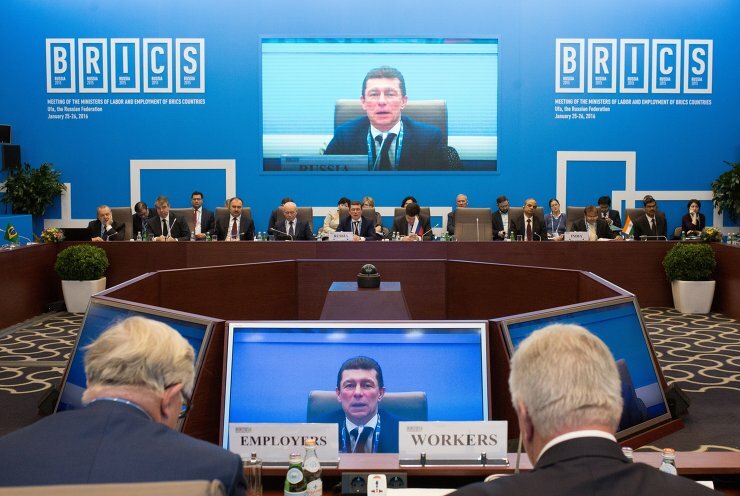 Minister of Labour and Social Protection of Russia Maxim Topilin at the Meeting of the BRICS Ministers of Labour and Employment. 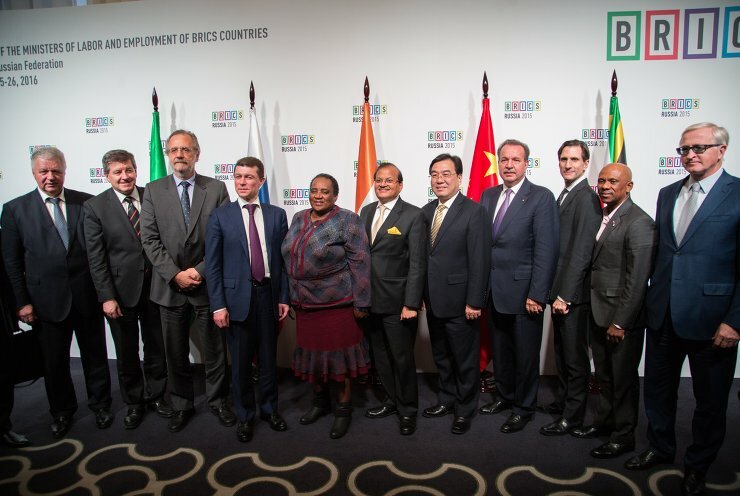 Participants in the Meeting of the BRICS Ministers of Labour and Employment. 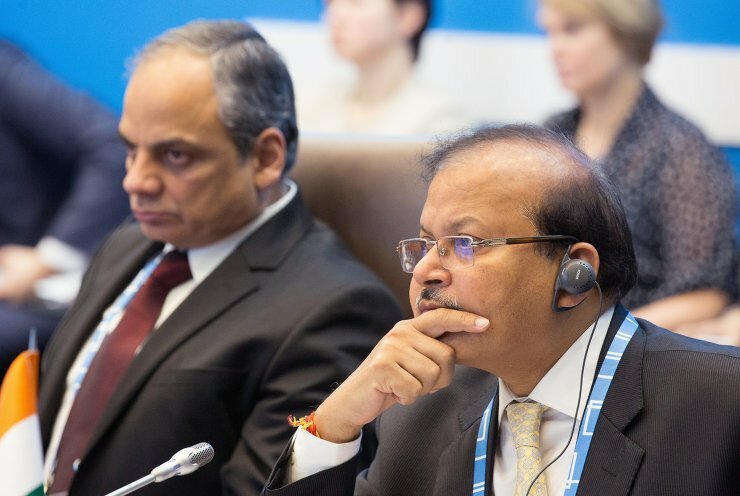 Aggarwal Shankar, left, Secretary of the Ministry of Labour and Employment of India, Delegation Head, at the Meeting of the BRICS Ministers of Labour and Employment. 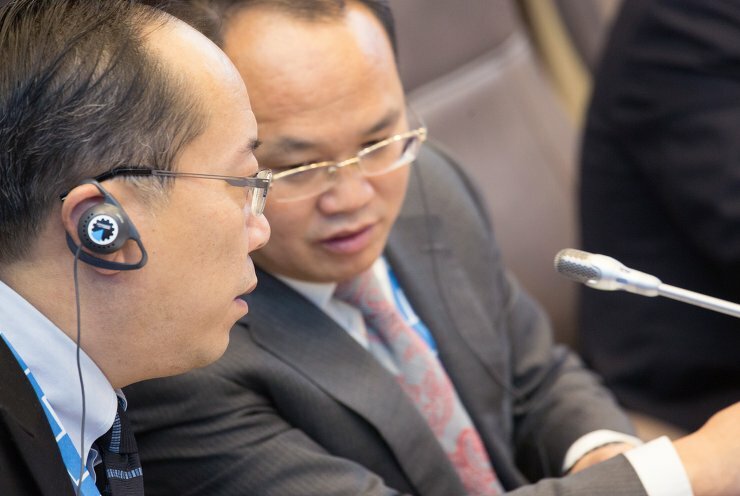 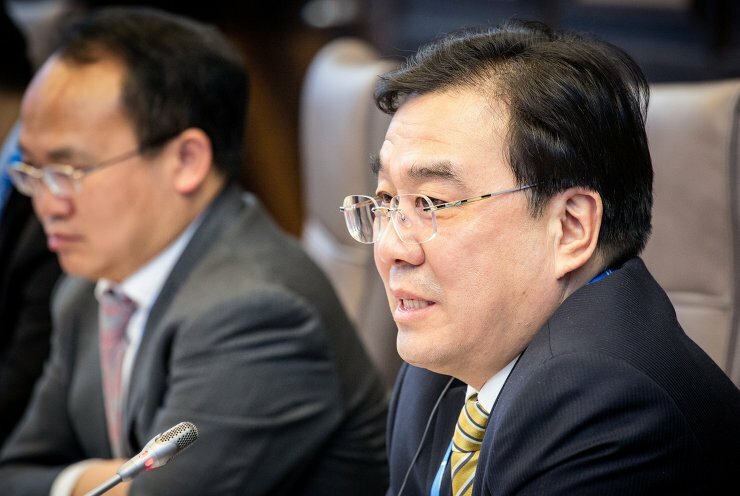 Xin Changxing, right, Vice-Minister of the Ministry of Human Resources and Social Security of China, at the Meeting of the BRICS Ministers of Labour and Employment. 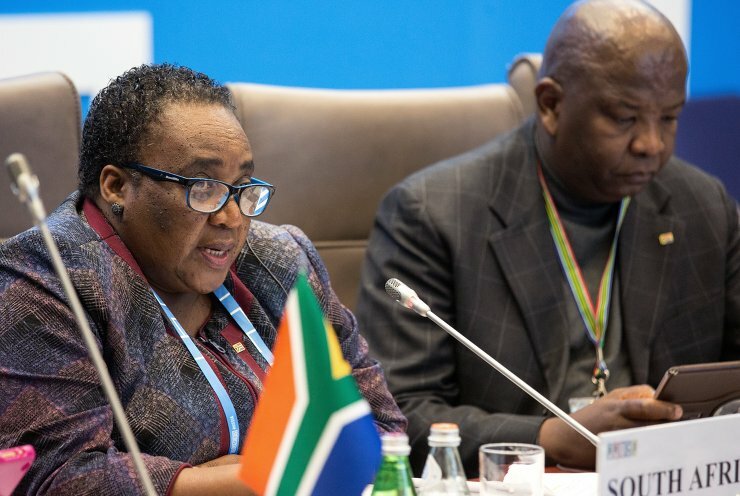 Mildred Oliphant, left, Minister of Labour of South Africa, at the Meeting of the BRICS Ministers of Labour and Employment. 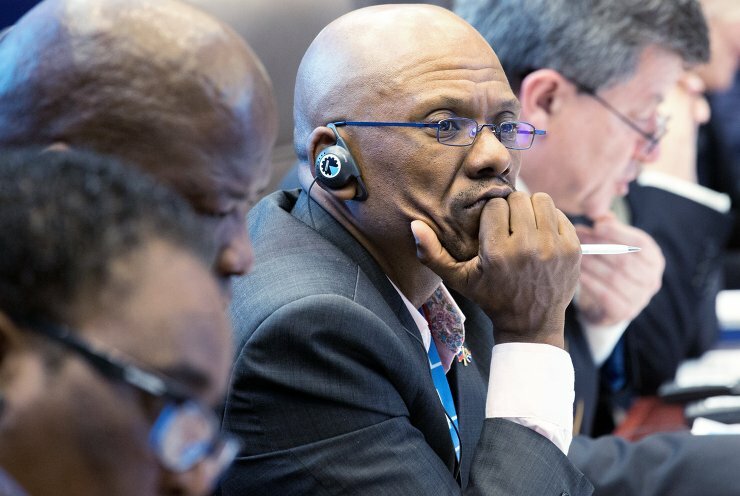 Participants in the Meeting of the BRICS Ministers of Labour and Employment. 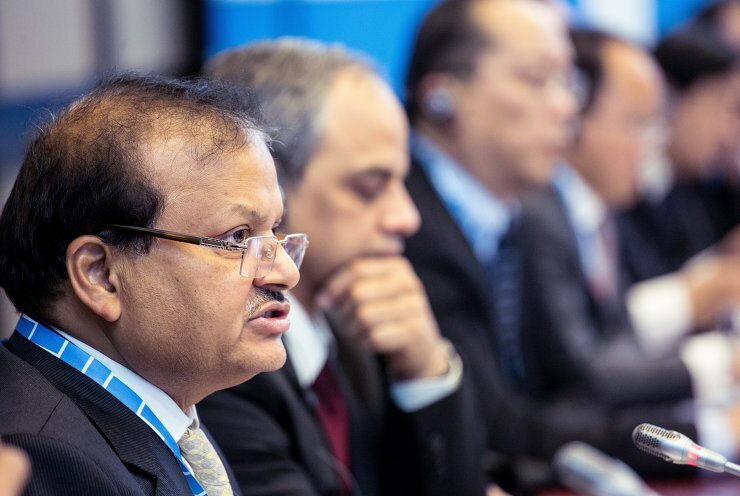 From left: Chairman of the Federation of Independent Trade Unions of Russia Mikhail Shmakov, Guy Ryder, Director-General of the International Labor Organization, Miguel Soldatelli Rossetto, Minister of Labor and Employment of Brazil, Mildred Oliphant, Minister of Labour of South Africa, Aggarwal Shankar, Secretary of the Ministry of Labour and Employment of India and Indian Delegation Head, Xin Changxing, Vice-Minister of the Ministry of Human Resources and Social Security of China, Hans-Horst Konkolewsky, Secretary General of the International Social Security Association, Keith Hansen, Global Practices Vice President at the World Bank Group, TZoro IBC CEO Mdwaba Mthunzi and President of the Russian Union of Industrialists and Entrepreneurs Alexander Shokhin. 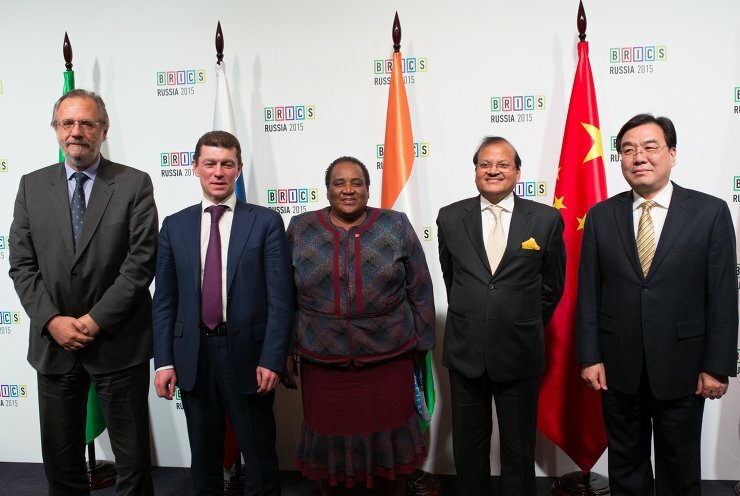 From left: Miguel Soldatelli Rossetto, Minister of Labor and Employment of Brazil, Maxim Topilin, Minister of Labour and Social Protection of Russia, Mildred Oliphant, Minister of Labour of South Africa, Aggarwal Shankar, Secretary of the Ministry of Labour and Employment of India, Delegation Head, and Xin Changxing, Vice-Minister of the Ministry of Human Resources and Social Security of China, at the Meeting of the BRICS Ministers of Labour and Employment. 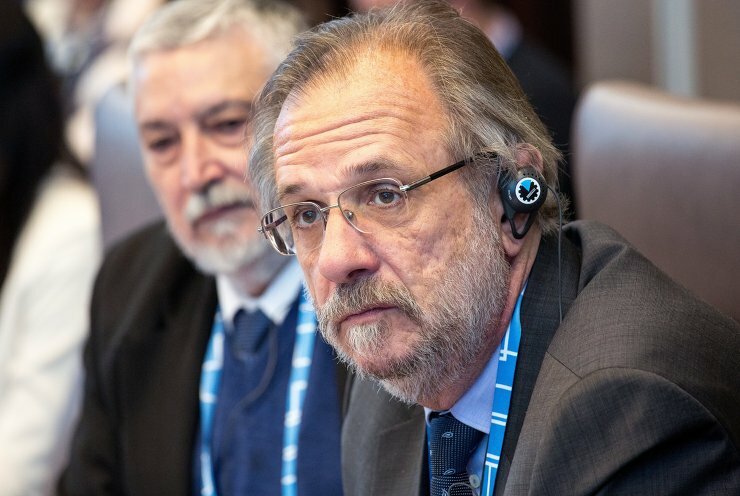 Miguel Soldatelli Rossetto, Minister of Labor and Employment of Brazil, at the Meeting of the BRICS Ministers of Labour and Employment. 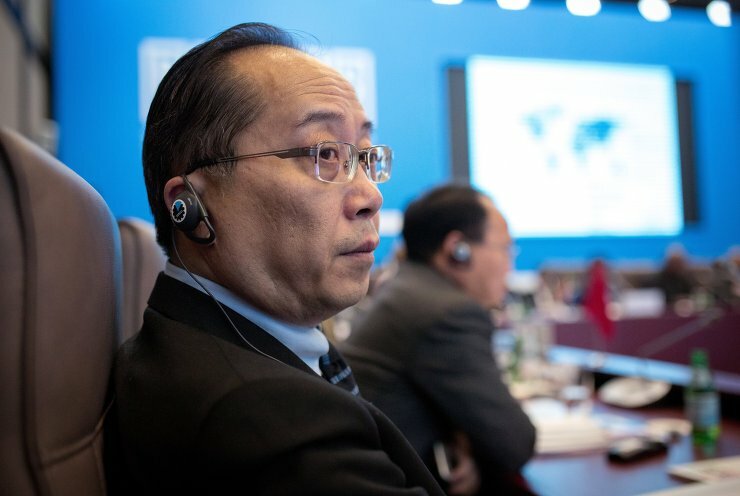 Lu Aihong, Deputy Director General of the Ministry of Human Resources and Social Security of China, at the Meeting of the BRICS Ministers of Labour and Employment. 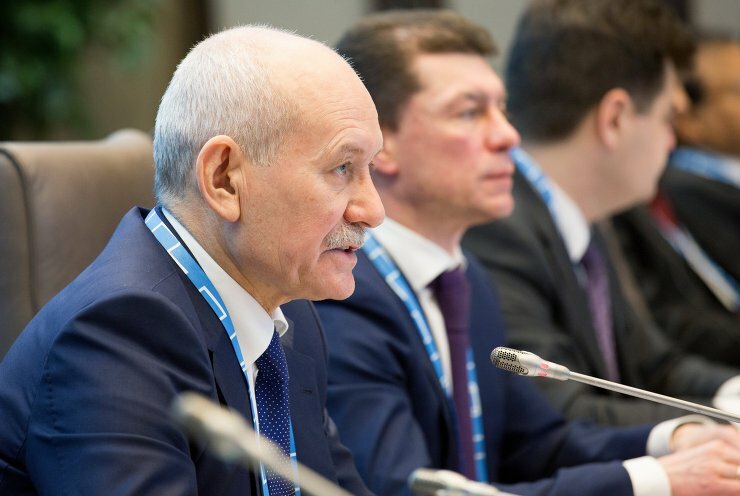 Ivan Dubov, Aide to the Russian Minister of Labour and Social Protection, Regina Azizova, Head of the International Cooperation Department at the Russian Ministry of Labour and Social Protection, and Igor Zemlyansky, Representative of the Russian Ministry of Labour and Social Protection, at the Meeting of the BRICS Ministers of Labour and Employment. 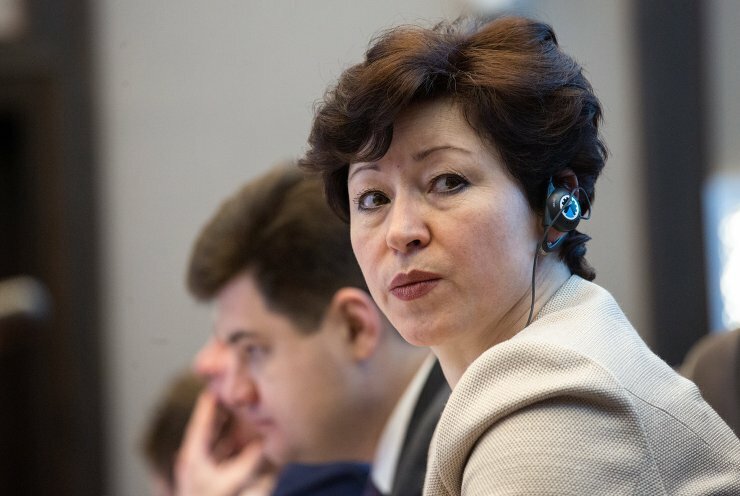 Lenara Ivanova, Minister of Labour and Social Protection of the Republic of Bashkortostan, at the Meeting of the BRICS Ministers of Labour and Employment. 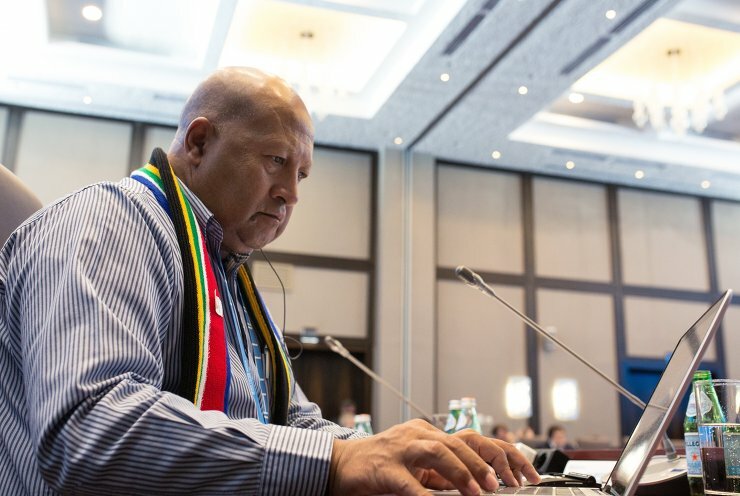 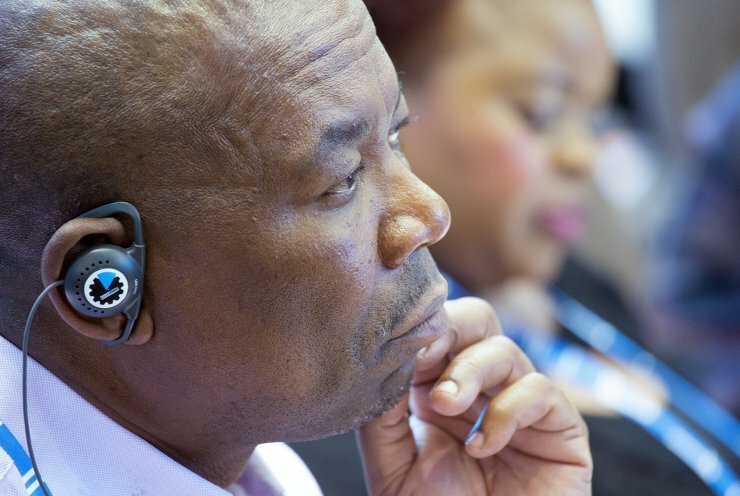 A participant in the Meeting of the BRICS Ministers of Labour and Employment. 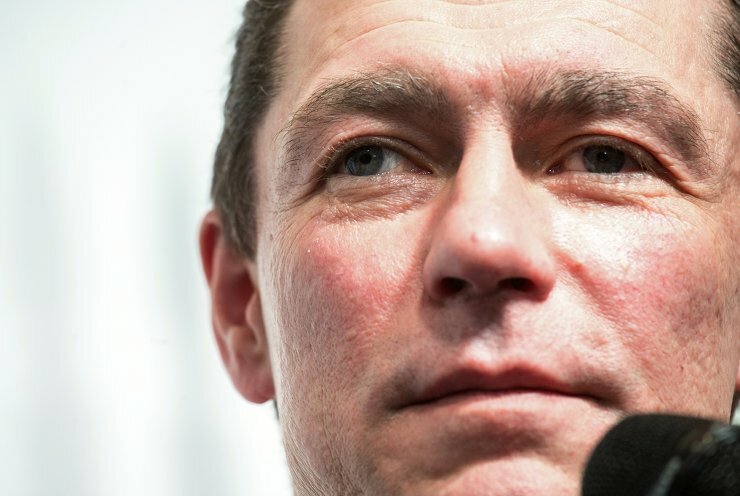 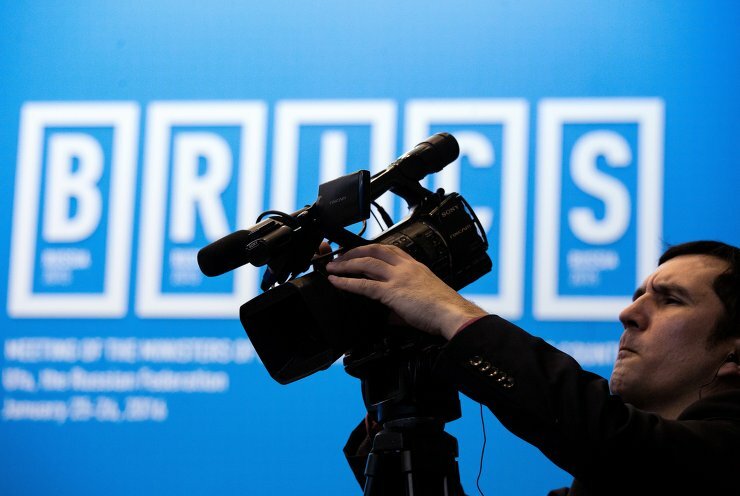 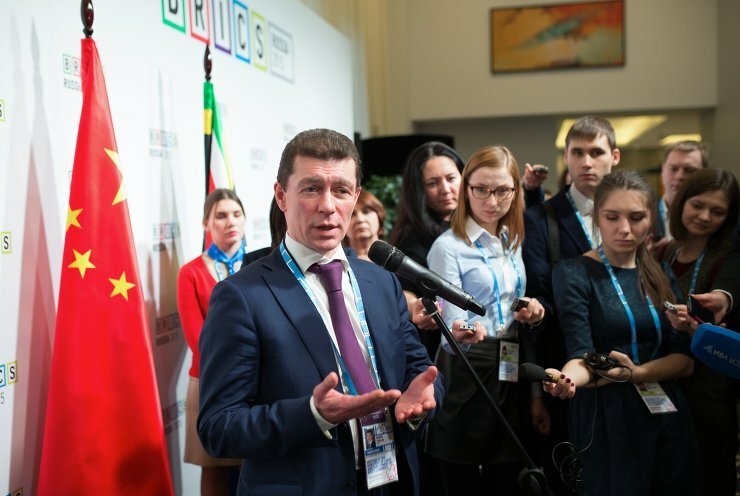 Russian Minister of Labour and Social Protection Maxim Topilin talks to journalists at the Meeting of the BRICS Ministers of Labour and Employment. 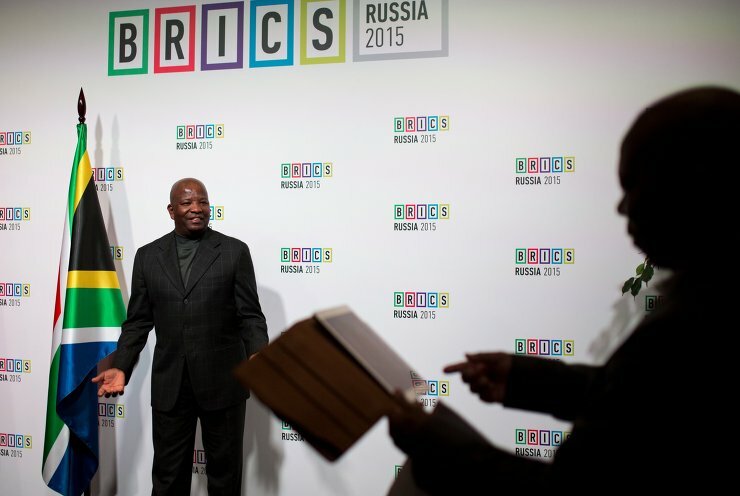 At the Meeting of the BRICS Ministers of Labour and Employment. 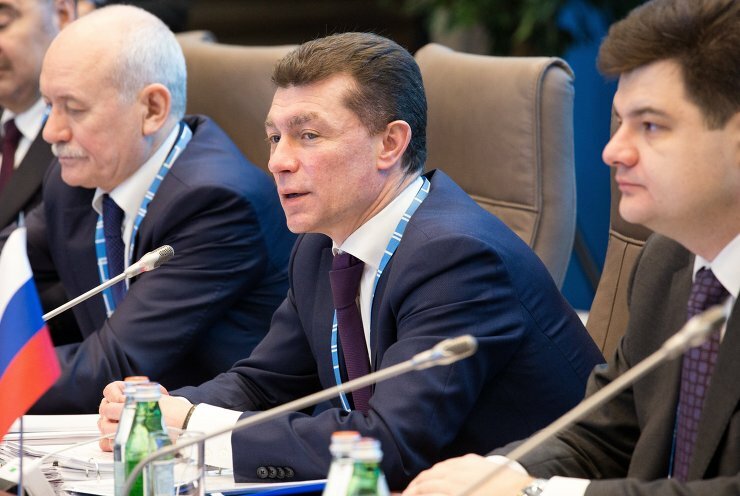 From left: Head of the Republic of Bashkortostan Rustem Khamitov, Russian Minister of Labour and Social Protection Maxim Topilin and Director of the Social Development Department of the Russian Government Staff Sergei Velmyaikin at the Meeting of the BRICS Ministers of Labour and Employment. 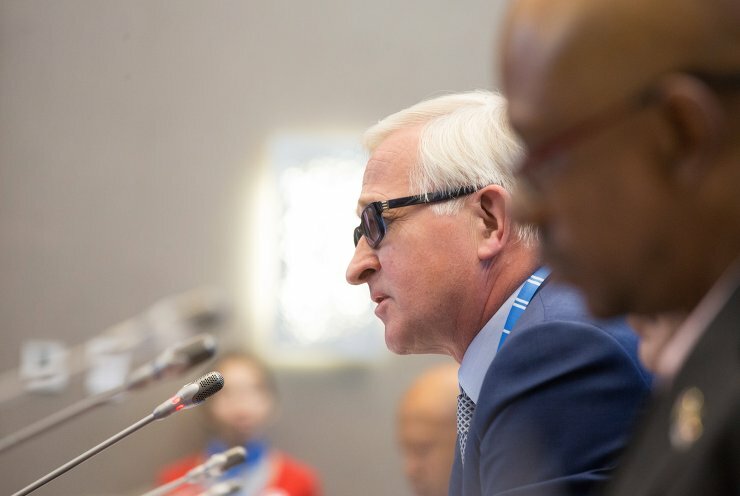 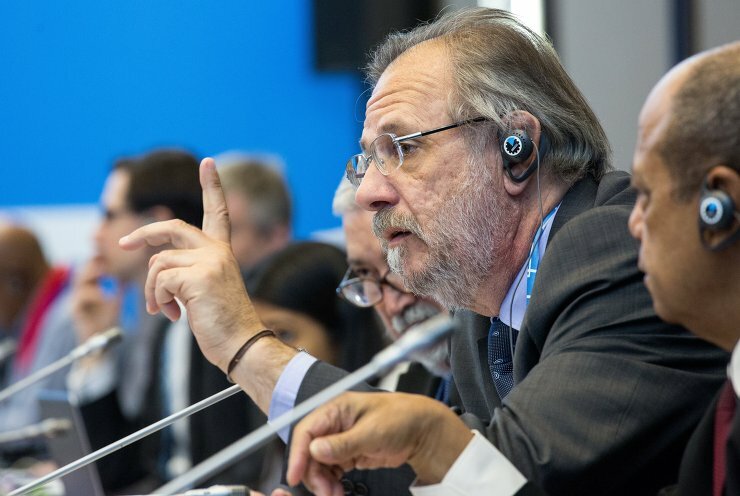 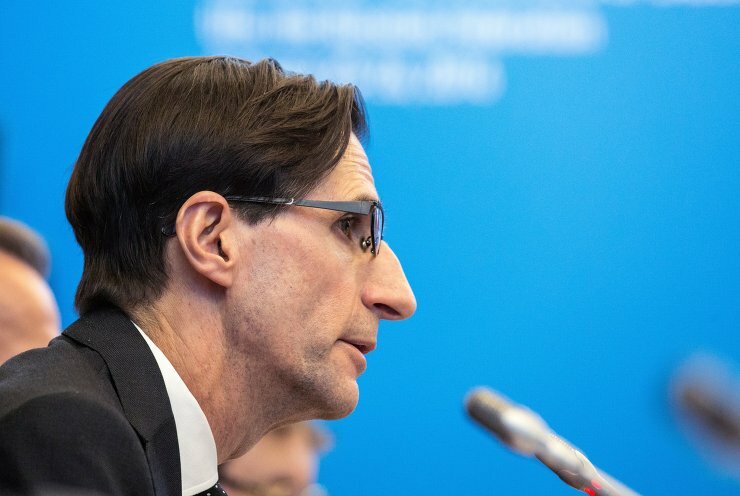 Hans-Horst Konkolewsky, Secretary General of the International Social Security Association, at the Meeting of the BRICS Ministers of Labour and Employment. 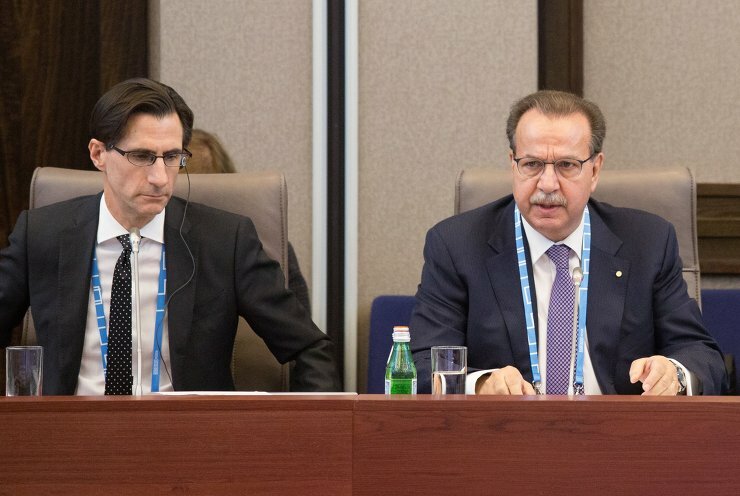 Head of the Republic of Bashkortostan Rustem Khamitov, left, and Russian Minister of Labour and Social Protection Maxim Topilin at the Meeting of the BRICS Ministers of Labour and Employment. 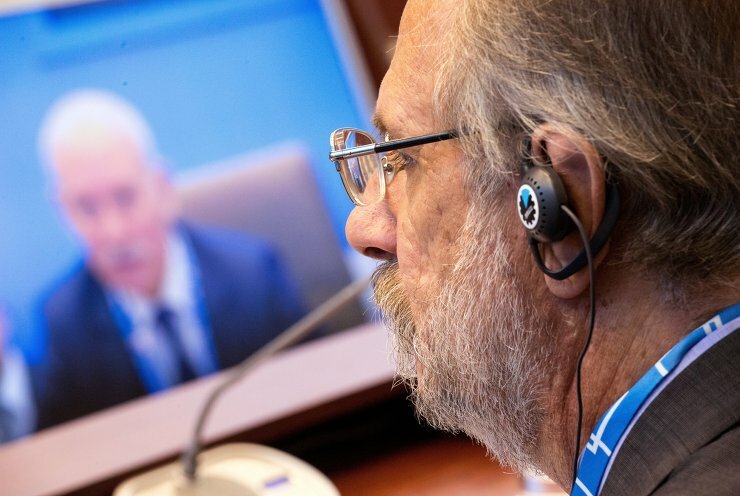 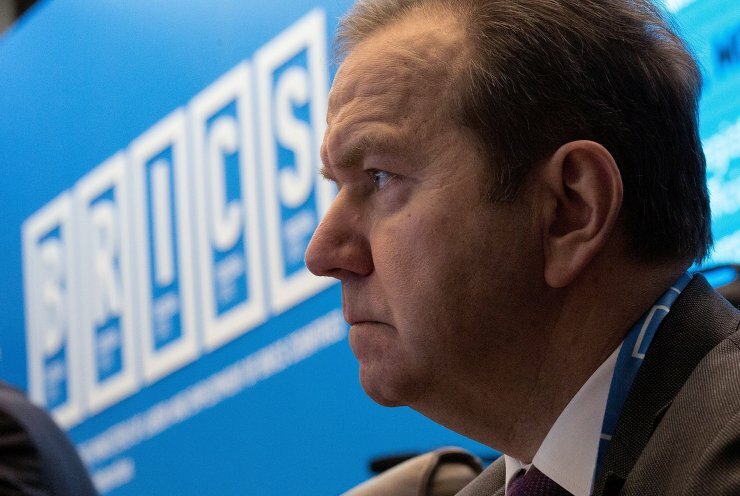 Keith Hansen, left, Global Practices Vice President at the World Bank Group, and Hans-Horst Konkolewsky, Secretary General of the International Social Security Association, at the Meeting of the BRICS Ministers of Labour and Employment. 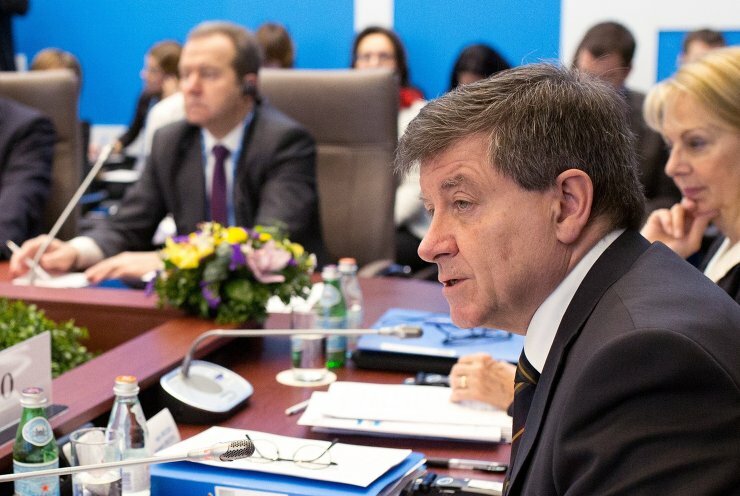 Guy Ryder, Director-General, International Labor Organization, at the Meeting of the BRICS Ministers of Labour and Employment. 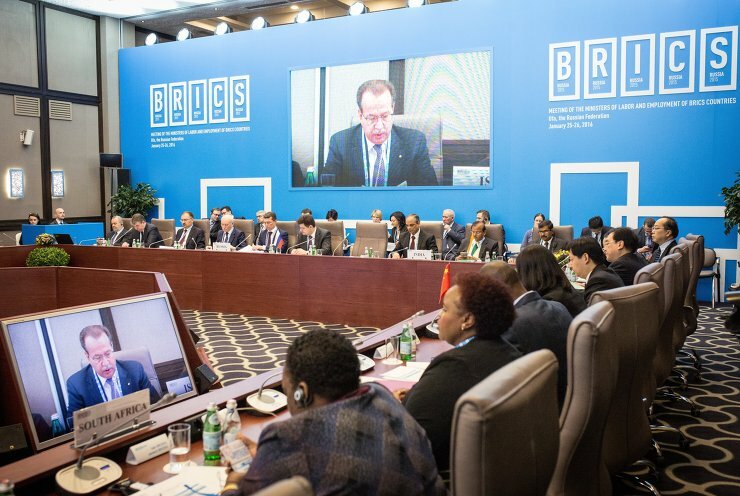 Keith Hansen, Global Practices Vice President at the World Bank Group, at the Meeting of the BRICS Ministers of Labour and Employment. 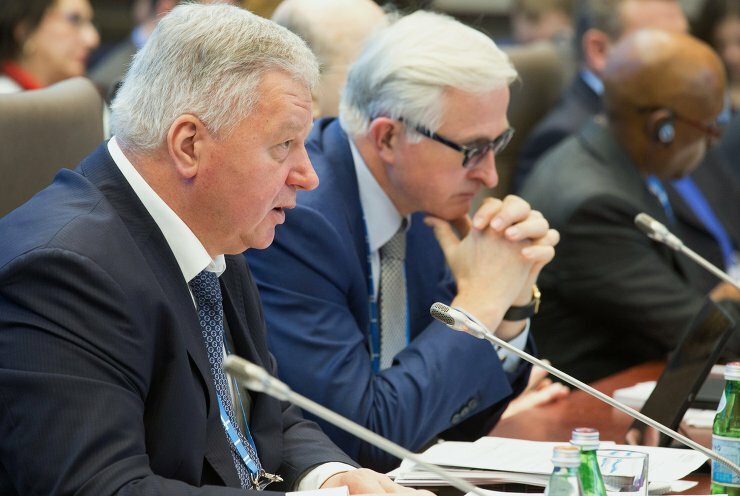 From left: Chairman of the Federation of Independent Trade Unions of Russia Mikhail Shmakov and Alexander Shokhin, President of the Russian Union of Industrialists and Entrepreneurs, at the Meeting of the BRICS Ministers of Labour and Employment. 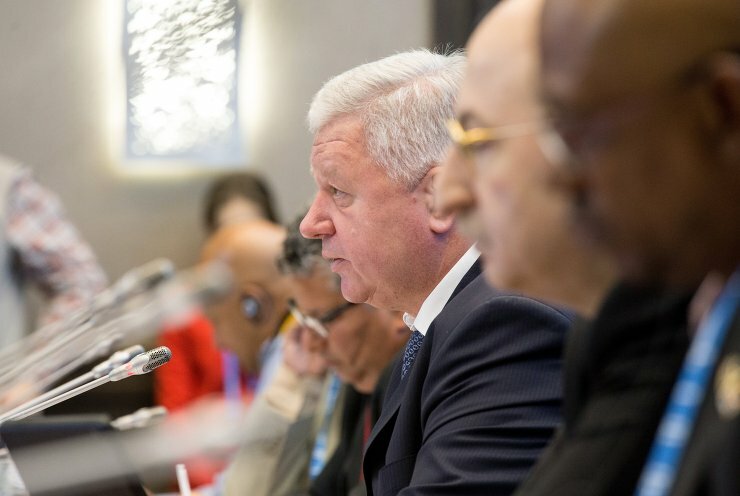 Chairman of the Federation of Independent Trade Unions of Russia Mikhail Shmakov, third right, at the Meeting of the BRICS Ministers of Labour and Employment. 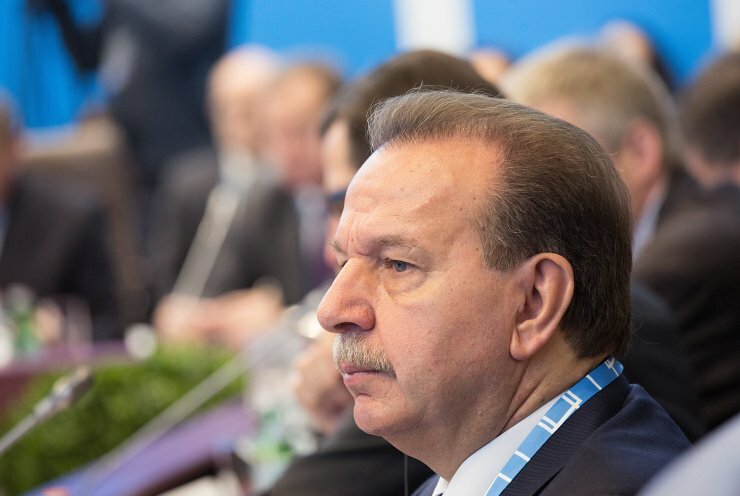 Alexander Shokhin, President of the Russian Union of Industrialists and Entrepreneurs, at the Meeting of the BRICS Ministers of Labour and Employment. 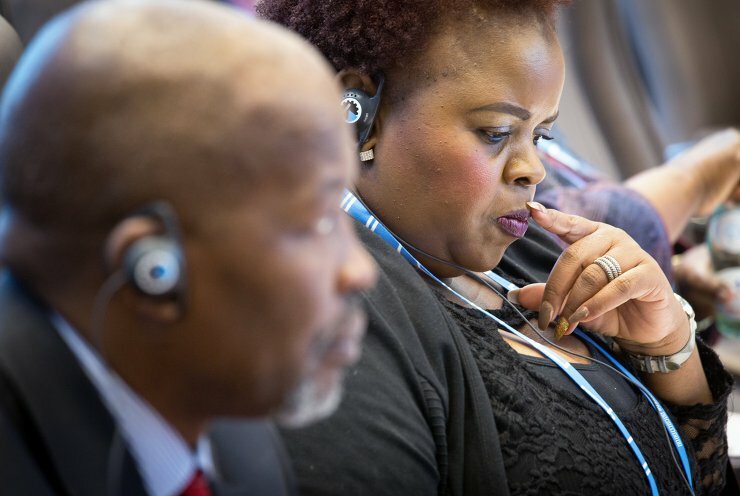 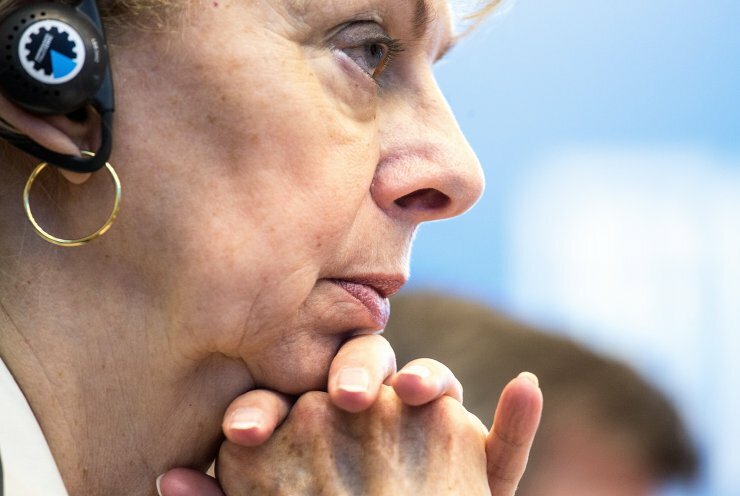 Sandra Polaski, Deputy Director General for Politics at the International Labour Organization, at the Meeting of the BRICS Ministers of Labour and Employment. 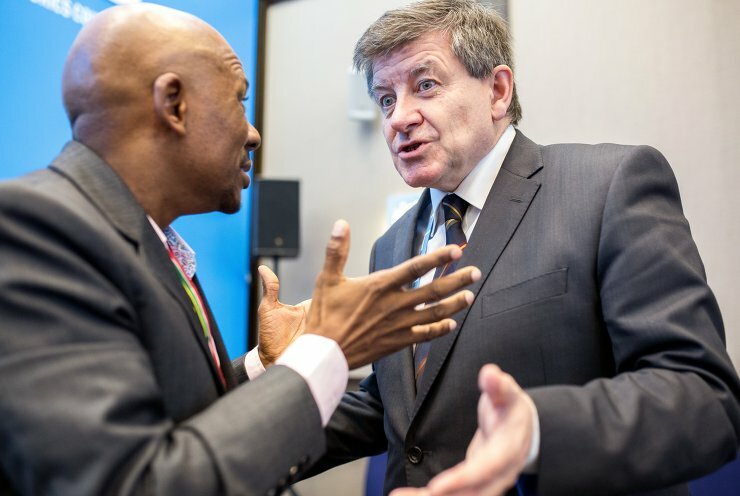 Guy Ryder, right, Director-General, International Labor Organization, at the Meeting of the BRICS Ministers of Labour and Employment. 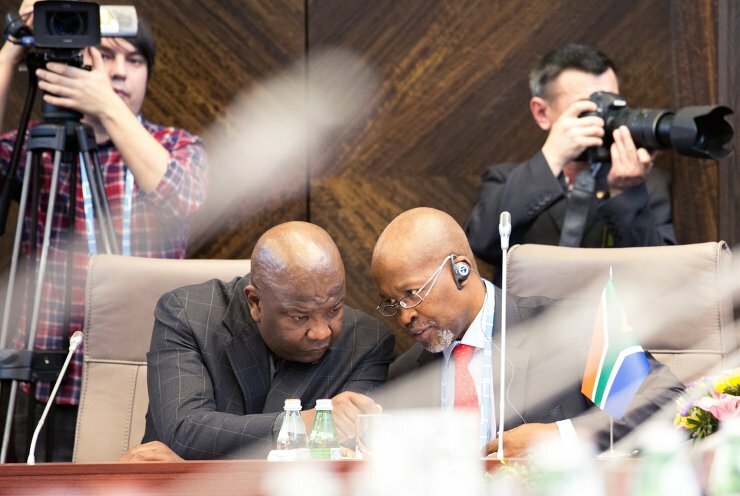 The Meeting of the BRICS Ministers of Labour and Employment.